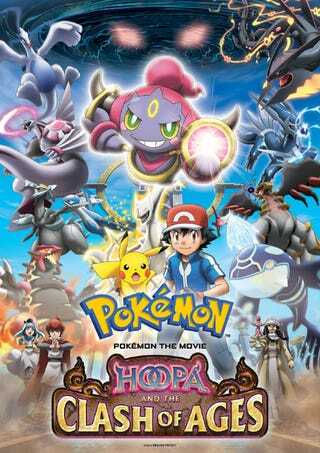 The Pokémon Company has begun to Stream the english dubbed trailer for the new Pokémon Movie, Pokémon: Hoopa and the Clash of Ages. The Trailer was premerd on Cannes France. "The 70-minute animated movie takes Ash, Pikachu, and their friends to a desert city by the sea. Here they meet the Mythical Pokémon Hoopa, which has the ability to summon things—including people and Pokémon—through its magic rings. After a scary incident, they learn of a story about a brave hero who stopped the rampage of a terrifying Pokémon long ago. Now, the threat that has been bottled up for years is in danger of breaking loose again! Can Ash help his new friend overcome the darkness within…or will a dangerous secret erupt into a clash of legends?. ".